One of the few fruits my carnivore will eat on his own volition is an apple. It seems my son has inherited his love of this fabulous fruit. From Honeycrips to Pink Ladies, Golden Delicious to Granny Smith, my guys like apples in all shades. So to please my guys and get more fiber in their bellies I am always trying to come up with new ways to use their favorite fruit. Of course, I can saute them as a side dish or bake them in a pie, but recently I decided it was the first and most important meal of the day that could use an infusion of fruit. 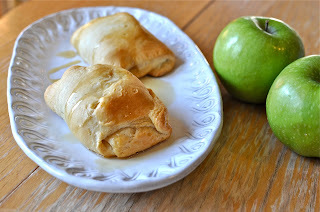 Enter these apple puffs. Start by preheating the oven to 375 degrees. Roll out the crescent rolls in one sheet. Pull apart to form four rectangles. Make sure any seams are secure by pressing dough together. Top each rectangle with a few slices of apple, then a dollop of whipped cream cheese on each, and finally a sprinkle of cinnamon. Roll each and place seam side down on a greased baking sheet. Bake for about fifteen minutes, or until golden brown. Remove from oven and serve warm with a drizzle of maple syrup. The result is a gooey sticky sweet creamy mess. And you won't hear any complaints about eating fruit for breakfast. Well, unless you have a carnivore like mine that thinks he doesn't like cream cheese. Let's just be glad for now my son hasn't inherited his picky eating gene. 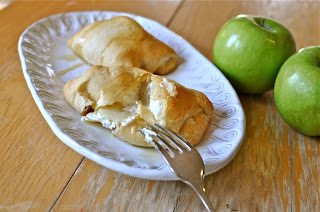 In the meantime, it means more apple puffs for me, I mean us, to enjoy. Wow. Judgmental much? He just "thinks he doesn't like cream cheese"? Which means, of course, that he's wrong. And so is everyone else who "thinks" they don't like sour dairy products. Wow. No, what I was saying it he actually does like it when it is cooked in things (cheesecake for example), but if you offered it on toast he'd turn his nose up at it. And in my family we don't judge anyone's food choices - that's how we make it work!